At least 14 people have been killed and over 110 injured in two separate attacks in the Spanish city of Barcelona and nearby coastal town of Cambrils. In both incidents, the suspects deployed vehicles to run pedestrians over. 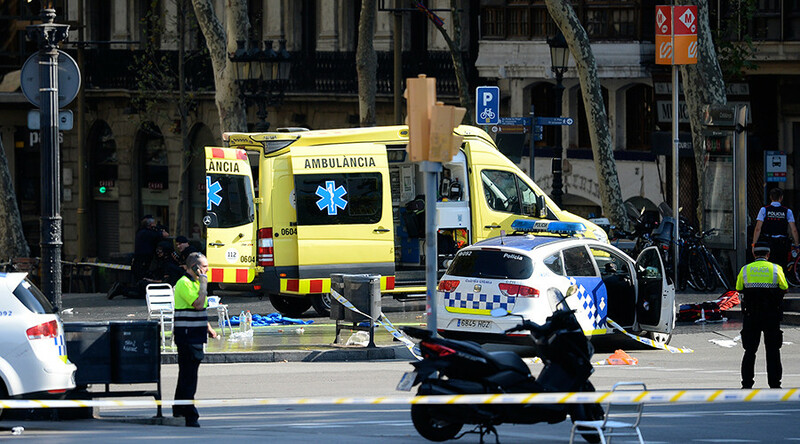 In the first incident the driver of a white van struck a group of pedestrians in Las Ramblas (La Rambla) area of Barcelona city center, killing 13 people and injuring over a hundred. The second incident took place hours later in Cambrils, 100km from Barcelona, injuring at least six people. One of them later succumbed to her injuries. Islamic State (IS, formerly ISIS/ISIL) has claimed responsibility for the Las Ramblas attack. The official Catalan Police Twitter account has shared a video of some of their officers being applauded by a crowd of people in Barcelona today. The message reads: "We would like to share with you one of the many expressions of support received that encourage us to keep working. Thank you". The house of an imam, identified as Abdelbaki Es Satty, was raided Saturday in the town of Ripoll over alleged links with the terrorist group responsible for the attacks in Catalonia. The main goal of the search was to obtain DNA evidence in the apartment, as investigators believe the imam might be one of the two dead people discovered in the Alcanar house after an explosion there, El Pais reported. The imam was last seen Tuesday according to his landlord, a day before the explosion in the village of Alcanar Platja, which investigators believe to be connected with the terrorist attacks, Reuters reports. Catalan police have appealed to people not to reveal information about their operations in the region. Catalan police have tweeted an appeal to the media not to interfere in their investigations, saying that two reporters managed to access a sealed building. They did not specify where the building is located. So far, seven of the 14 victims of the Barcelona attack have been identified, as has the one civilian killed in Cambrils. Catalan officials say that 54 people remain hospitalized, and 78 have been discharged since Thursday's attacks. Catalan authorities have identified another victim of the Barcelona terrorist attack, a Portuguese national. French authorities are carrying out extra checks on people traveling over the shared border with Spain, an unnamed security official told the AP. The move is reportedly a routine response when neighboring countries flag a potential risk. Spanish authorities believe the terrorist cell behind the Barcelona and Cambrils attacks has been fully dismantled, Interior Minister Juan Ignacio Zoido said Saturday. The government will maintain a level-four security alert, Zoido added, one notch below the level indicating an imminent attack is expected. Security will be reinforced at tourist areas. Police issued an alert Saturday morning advising of planned "controlled explosions in Alcanar". Authorities say a suspected bombing plot, linked to the Barcelona and Cambrils terrorist attacks, was likely thwarted by an explosion at a property in Alcanar on Wednesday night. Police have identified the 5 terrorists killed in Cambrils. Cadena Ser are reporting that they are all between the ages of 17 and 24.